When I was growing up, some of my favorite holiday gifts were the board games my parents gave to me and my sister. 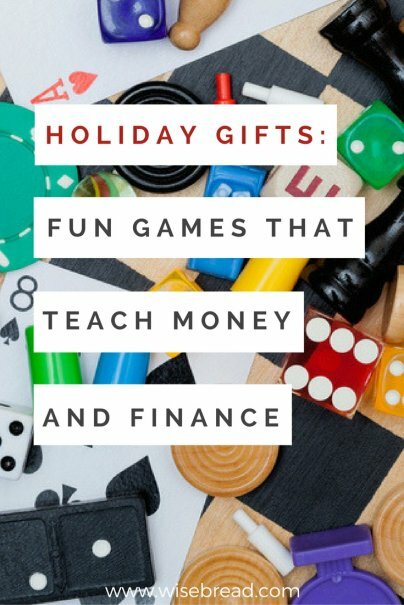 Not only did receiving a board game ensure that we would be spending time together as a family, but I also loved how new games could teach me different ways of looking at the world, and managing money in particular. Acquire is based on the idea of creating a super city, wherein each player tries to invest strategically in various businesses, including entertainment, food, fashion, marketing, and other major industries. Throughout gameplay, the various "venture capitalists" compete to build the city and try to own the majority shares in the most lucrative businesses. You make money by forming, merging, expanding, and acquiring businesses, and by buying stock at the right time — which makes this game an excellent introduction to how investing works. Whoever has the most money at the end of the game wins. Imagine you are trying to make your fortune in the oil fields of Texas in 1922. That's the basis for the oil prospecting game Black Gold, where between two and five prospectors compete by exploring the terrain for oil wells, surveying the possible sites, and building derricks. You can earn money by transporting your oil to one of three companies and earning the right to sell at auction. Game play includes bidding, bluffing, and strategizing — which can help your kids learn good negotiation skills while they try to glean the most wealth from their oil wells. This game, which was first introduced all the way back in 1904, helps to recreate the now (mostly) defunct open-outcry trading one used to find on the floor of the New York Stock Exchange. Pit is a card game wherein each player attempts to corner the market in a particular commodity. The winner of any particular hand is the first one to collect all of one commodity, and points are awarded based on the value of the cornered commodity. The overall winner is the first player to score 500 points. Not only will this game give you a chance to shout and wave your arms a la Dan Aykroyd and Eddie Murphy in Trading Places, but it will help you to better understand exactly how commodities traders do their jobs — even if it's mostly handled by computers these days. Helping your kids understand how the stock market works can be an uphill battle, until you break out this board game. With Stockpile, each player is a stock market investor. The game helps make it clear that everyone knows a little something about the stock market, but no one knows everything. That means each player receives one piece of insider information, but there are plenty of unknowns facing each investor as well. You must consider multiple factors when buying or selling a stock, just as you would in real-world trading. Whoever has the most money at the end of the game wins, but everyone will certainly learn important investment strategy skills from this game. In Tin Goose, it's the early days of commercial airlines, and each player is attempting to build a large, profitable airline. You are helped by the fact that planes are becoming safer and more fuel efficient over time. But even as your planes get better, you will also face more and more disastrous potential setbacks such as crashes, worker strikes, and spikes in oil prices. This game will help teach how to balance the emotions of greed and fear while strategizing how to build your business in competition with others.